Okay, the new trailer for Hellboy just came in recently, and while its not the kind of movie I was expecting, I’ll take it. I was expecting something a lot darker, but who knows? It’s just the trailer. It ain’t Guillermo, but it does at least look like fun, the trailer has some nice comedic beats, and I like the rest of the cast. I’m glad to see there are some PoC in this one, although it wasn’t a deal breaker for me if there weren’t becasue the trailer looks good. The only drawback I can see is Hellboy’s makeup looks a little stiff, but I can get past it. The woman with the dreadlocks is Sasha Lane, playing a character named Alice. I don’t remember her from the books, so I must have missed that particular storyline. In the books she eventually becomes a Queen of the Fairies. The Asian guy is Daniel Dae Kim (Woo!) playing a half Japanese character named Major Ben Daimio. Now his story I do remember from the books, including the story of how he got his facial scars. In the comic books he eventually becomes a kind of Were-jaguar. 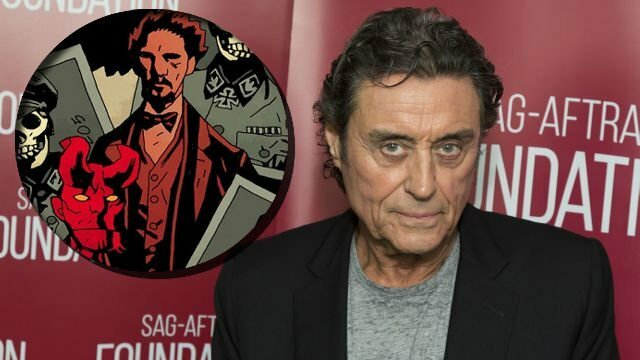 Ian McShane(Odin himself from American Gods) is playing Professor Bruttenholm, the man who found Hellboy as a child and raised him as a human. If Milla Jovivich is playing Nimue The Blood Queen, then the movie could be about Alice’s story, and the death of Queen Mab. There;s also the rumor that Hellboy would be visiting Fairyland, which must be what all the horseback riding is about. Some of you will remember that the actor originally chosen to play this role was Ed Skrein, who quit the role after fans protested that the character was meant to be of Japanese descent. Hellboy 2019 is directed by Neil Marshall, the director of Dog Soldiers, Doomsday, and The Descent. This weekend, Dec. 21st, I’ll be watching Birdbox, starring Sandra Bullock. I haven’t read the book yet, but the basic story is some force comes to Earth, and if you see it, you kill yourself. Sandra Bullock’s character, and her two children have to travel to another location for safety, but have to travel through this apocalyptic landscape while blindfolded. What I like about this is that its a female led story, directed by a woman, so some of the usual thriller tropes may be overturned. Maybe. And finally, here’s the trailer for Downton Abbey, the movie. I am forever NOT referring to myself as a fan of something, but I guess I am a fan, because I watched every episode of every season. I can’t explain why I began watching it, but I do know why I stayed: The characters.